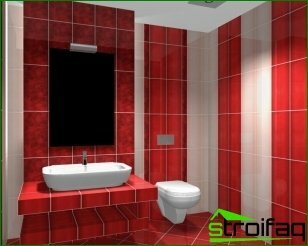 We continue to consider how to formalize design bathroom tiles Photo. 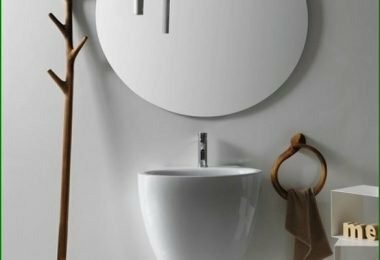 In the first part we focusedon the choice of color or set of colors, and also reviewed the basic principles that should guide the design of the bathroom. Now we will dwell on the choice of interior style for this room. A certain popularity in the choice of designceramic tile uses geometric direction. For such a finishing material peculiar pattern in the shape of circles, rectangles, triangles and other complex and simple geometric shapes. This style is sure to attract bright, creative and innovative individuals who are interested in modern design. 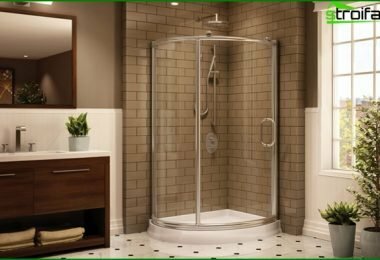 Tile in the bathroom design which is made in the classic style, willbright and uniform wall in the upper portion and darker in the lower part of the room. You can spice up monotonous appropriate range, using a special decorative tiles with different images. In addition to these goals can serve as borders, friezes and baseboards. Classic style is highly spread. 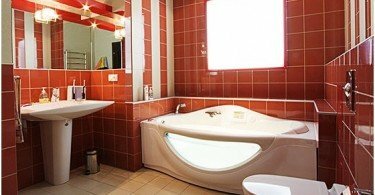 The bathroom features a modern style,perfectly fit fotoprint. You can create an image tile that will be applied to it. Most often used is amazing landscapes nature night city image and other drawings. Using fotoprint is especially important for small bathrooms because this style can visually expand the space. 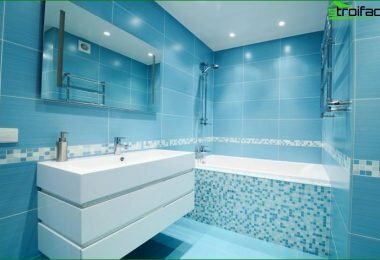 One of the most recent trends at registrationthe bathroom is the use of large format tiles. Plain tiles often has a size of up to 15 centimeters. The form of large-format tile is rectangular, and the size of its order of magnitude higher than conventional products. The advantage of this material is not only stylish, but also the ability to visually expand the space of the room. You can make vertical stacking of material, resulting in an increase in the visual height of the room, and visually enhance its horizontal position helps the surfacing material. Modern tiles in the bathroom design which is properly selected, it will help to create the desired mood in the room. Refer to your own tastes, they will help you choose the optimal color of the coating and its style. As a rule, for finishing ceramic flattiles allowed the same common mistakes. 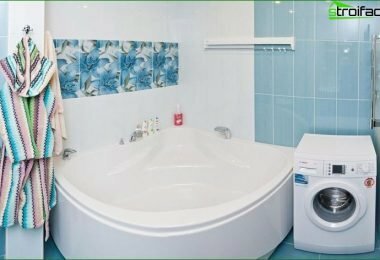 Often, in prefabricated houses bathrooms are not very large in size. And if the room is tiny, the use of large format tiles is not the most rational solution. Why? In this case it is necessary to do a lot of slits, resulting in a loss of an aesthetically pleasing appearance. 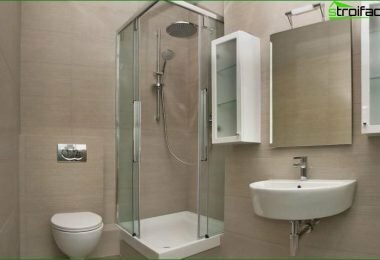 Therefore, if you have a small bathroom, give up the most modern large-format tiles. It is better not to save money by buying cheap franklycopies of Spanish or Italian tiles. As a rule, the quality of cheap imitations poor. Even before the renovation sure you throw a large part of the tiles. Another common phenomenon - the formation of chips on the finishing materials after laying. The cheapest tiles geometry is far from ideal, and therefore obtain a perfect surface of the floor and the walls will not succeed. To adequately equip the bathroom, do not take the money for its original tiles. If your financial capacity is limited, then use the material of domestic producers. From the use of copies should be abandoned. Let the product will not be as stylish and refined, but it will have the proper quality. In this case, you do not have to pay twice.